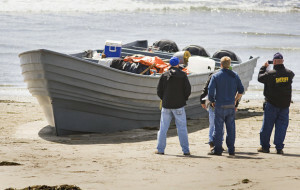 An abandoned panga boat was found on a beach approximately four miles north of the Piedras Blancas Light Station on Thursday. At about 1:30 p.m., a California Parks ranger driving on Highway 1 noticed a break in the fence line. Upon further investigation, he discovered a panga boat beached on the sand. Investigators believe. based on the evidence they found at the scene such as articles of clothing, that the boat may have been transporting both people and narcotics. However, no drugs were discovered. The latest panga is the third discovered in San Luis Obispo County this year and the 13 since early 2012. The investigation is ongoing. Score Mexico 13, US 0. Is this a new one or the same one put out there again. It would be interesting to know where the money for the motors goes,I’d be pretty sure they are not trashing them. You can sleep well knowing that the “Homeland Security” and NSA know about every keystroke we type here even thought they can’t seem to make a dent in the smuggling business , no matter how much money they throw against it. Gotta wonder if these drugs will make the evidence locker of if they will be sold to generate personal revenue? This is a ‘problem’ because there is a demand for the product here in the US. We should know that this smuggling will continue, involving nefarious elements, as long as prohibiton that doesn’t work is on the books. Decriminalize or make legal small, recreational use of marijuana and these panga runners will dissappear. The price will go down, while raising millions in new tax revenue. I don’t use or have any desire to. That being said, the solution here is so simple. Not a good reason to legalize marijuana. The panga runners will NOT dissappear, they will just switch to another drug, such as cocaine. You still find many illegal marijuana farms tucked away in deep forests even in those states where it has been made “legal”. The difference is the cartels what a piece of the pie and would undercut prices just to get their share. Ah yes… yet another boatload.I certainly sleep well at night knowing that not only is our coastline so well protected, but that those who choose to come here illegally and smuggle drugs into out country will be able to stay, get a drivers license, get insurance, go to law school. become a lawyer, and someday become a politician or a judge. OPEN UP THAT GOLDEN GATE…CALIFORNIA HERE I COME! Mexico, the neighbors from hell.